For most of the AIC Podcast Homilies (each linked from the Podcast Homilies page at the AIC web site (www.AnglicanInternetChurch.net)), the homilies explain the actual Epistle and Gospel readings (in this case Acts 2:1-11 and John 14:15-31). On this occasion — since the first text is quite clear in its meaning and the second text (John 14) was discussed in a recent AIC Bible Study episode — I’ve focused instead on how the Holy Spirit becomes and “indwelling” Spirit referred to in traditional liturgies since at least the 4th Century (after the Nicene Creed’s adoption & its amendment in 381 A.D.). Among the leaders of the Eastern and Western Church I mention are Gregory of Nyssa and Basil of Caesarea, both 4th Century, and Martin Luther (16th C.), plus a quotation from Ephesians 4. We owe to St. Basil of Caesarea the understanding of the equality of the Holy Spirit as one of the three Divine Persons of the Holy Trinity. His work is still available in a short paperback version under the title On the Holy Spirit. 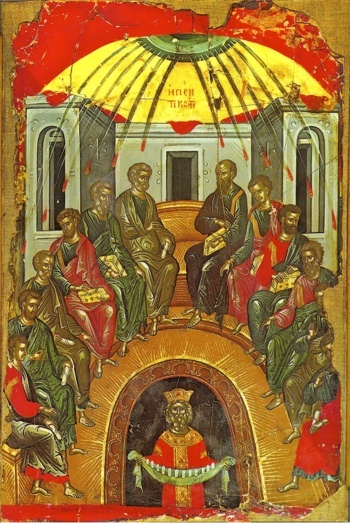 .At left is a 15th Century icon of the Descent of the Holy Spirit showing the Apostles assembled as Jesus commanded them to do. The flames or rays of fire described in Luke’s account reach down across a golden arch. For all the Sundays celebrating Whitsunday/Pentecost and Trinity season I will use a string and piano version of Robert Robinson’s Come Thou Fount of Every Blessing, written in the 18th Century and played to a Celtic-like arrangement of the tune Nettleton. Robinson, an ordained clergyman in the Methodist tradition, wrote the song to accompany a homily delivered at Norfolk, England. I edited the original 3:20 version into a 1:20 opening version and a 14 second closing theme. The song opens with a violin solo, which is then joined by another stringed instrument, and then by a piano. I will be using the same music for the final episode in the AIC Bible Study series on the Gospel of St. John, since one of the verses quotes Jesus’ comments to the Samaritan woman (St. Photina) concerning the Living Water. I wish each of you a joyful celebration of the Descent of the Holy Spirit and remind all of you of the traditional teaching that the Spirit becomes an “indwelling” Spirit only when we invite the Spirit into our hearts.